Before the election, crusty Jello mold Donald Trump employed an enormous group of aggressive private security officers, even after he was granted Secret Service protection. As president-elect, he is still employing an an enormous group of aggressive private security officers, headed by a guy who, in the span of one week, forcibly ejected Jorge Ramos from a press conference and then punched a Latino protester in the face. Politico reports that Trump continuing to employ a private security team after being elected represents “a major break with tradition,” which is true, unless you’re talking about the traditions of authoritarian countries. Through the end of last month, Trump’s campaign had spent more than $1 million on private security contracting, compared to $360,000 spent by the campaign of his vanquished Democratic rival Hillary Clinton, according to Federal Election Commission reports. That’s despite the fact that every other aspect of her campaign operation dwarfed his. Overall, her campaign outspent his by nearly 75 percent overall. In April, Politico called Trump’s security team a “privatized mercenary force,” noting that he was sued in September 2015 by a group of Latino protesters who led a demonstration outside Trump tower. The suit alleges that the private security team, led by retired NYPD detective Keith Schiller, forcibly took signs from them as they stood on the sidewalk. Schiller then hit a demonstrator named Efrain Galicia in the head when the man tried to wrestle the sign back. 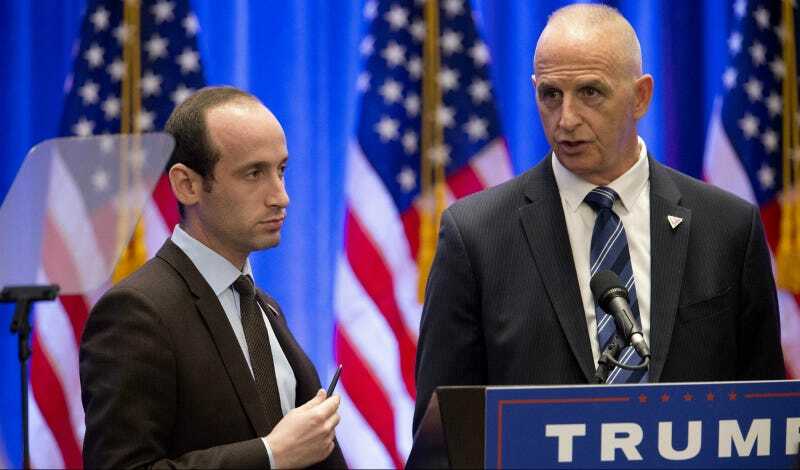 A transition team official told Politico that Schiller, the ex-NYPD detective, is a loyal member of the Trump team, “kind of a consigliere,” and expected to accompany Trump to the White House. Associated Press photos show that Schiller was with Trump on November 10, when he first went to the White House to meet with President Obama. Trump Tower also continues to be protected by Secret Service, the NYPD, and Trump’s private security, a costly arrangement that’s expected to continue for all four years of his presidency. The NYPD is asking the federal government to reimburse the city $35 million in security costs that have been incurred so far.